Thought for the Day… your 2 best days of your life and the 2 saddest. Something got me thinking about legacy yesterday. This is a topic that many motivational speakers and personal coaches use to help people define their purpose on earth. Reaching into the ‘why’ in our lives. Knowing it can help us keep on track, create our vision, find purpose in our actions, even market ourselves in a more authentic way. I Googled the term, expecting to find the top searches being with this in mind, instead I read the definition of its actual meaning, the origin of the word appears to be literally about something you tangibly leave to someone… of course, that is its true meaning. “…..an amount of money or property left to someone in a will. I wonder if a brilliant marketer, used in a book or a speech to garner entrepreneurs to make their difference, dreamt up the more recent use of this word ‘legacy’? It is good, it does make you think. Over time, we have all sat in front of speakers, read books and blogs and thought about whether we are having real impact. Does what we do have a level of value that gives the customer a greater amount than it cost the. The ROI (return on investment) that all customers are seeking. None of us want buyers remorse, the feeling that I spent money on something and I wish I hadn’t. Last night I went to a new chiropractor for a hamstring problem that I have had for nearly a year now. 15 minutes later, £38 poorer, I left with that feeling of loss, regretting the cost and time. This morning, I have woken with her predicted brilliant legacy, a dead leg and the acceptance that maybe 15 minutes with her, was worth more than the 15 hours I have spent with a sport masseuse, I think she has got into the problem, so is ROI about impact or time given? So, is ‘legacy’ about what you leave behind, each time you support someone? Are we actually thinking about this when we drive our purpose, or are we thinking about time, invoicing our time…. the 15 hours of massage has cost me £300 over the past year, charged at half the cost and 4 times the time than the Chiropractor, however, the ROI of the Chiropractor may be better! It makes is wonder, are we selling time, or value? So today, I am writing my core speech again, refreshing it, as I have a lot of talks to give over the next 2 months. 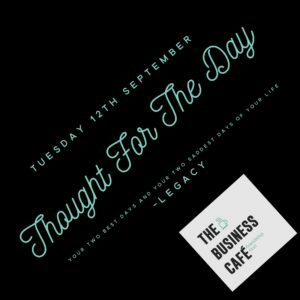 I will think deeply about legacy, my why, and the reason The Business Cafe will exist, hopefully way beyond my lifetime. Perhaps today, while you go about your work, you can think about whether you are leaving something behind that is far greater than a moment in time, that your impact lasts, perhaps not a dead leg, but an impact that those you interact with, take away something that impacts them beyond the moment you spent with them.